No, this is not an exorcism or a poor attempt at a Seance. It’s the first ten copies of Satan’s Docket purchased in ten minutes on the day of its release at a popular restaurant, White Lake Inn, in the Adirondack Mountains of upstate New York. Well the day has finally come, the earliest release of my startling new book to be formally published later this summer regarding divorce and family court corruption. I am making the opening chapter available at no charge as a gift to all loving dads on Fathers’ Day 2017. Please share it freely. It is also a release that is highly beneficial as an educational product for all abused parents and families. The background for this book and an excerpt demonstrating its wide appeal were posted here the past two nights. This one will conclude my Fathers’ Day trilogy. Last year, I was joined at this time by a doctor, dentist and engineer from different parts of the country on the steps of the United States Supreme Court. We conducted a news conference in support of a first-ever shared parenting case. Today, one year later, fathers continue to be discriminated and oppressed in these courts. Nothing has changed in decades while other equality movements have achieved great strides. Gay-lesbian rights, for example, have long passed us by. Due to my continuing stand, judicial whistleblowing and a pretend mother seeking to replace me with a millionaire father, I will not be able to see my daughters this Fathers’ Day. I have never been found to be unfit, never charged with any crime, never a child abuse report. The public is witness to my model parenting. Since my testimony before the Moreland Commission on Public Corruption in 2013, I have received no phone calls from my teen daughters. This form of cruel and unusual punishment is un-American and unprecedented from a human rights standpoint. My book is the foundation for a renewed crusade against the injustice. The pretend mother, Kelly Hawse-Koziol, has gone to the extreme of alienating my children in every way. Sadistic judges and lawyers bent on revenge have joined her sick agenda. Together they have managed to eradicate every aspect of the paternal family in a manner which would impress Adolph Hitler himself. The opening chapter of this book is my response. It is highly relevant to that alienation and should inspire all to action. The events you will read are shocking but true, backed by footnotes and voluminous files. Help me promote this three year project any way you can for the sake of similar victims. Unity is sorely needed. The complete 100,000 word manuscript has been offered to New York’s high court for protection from ongoing censorship by an unethical ethics committee whose chief counsel and deputy lawyers resigned quietly due to falsified time sheets. The book relates my ordeal and that of many others I met in a nationwide reform effort. Nearly every paragraph, phrase and word contained in this literary work carries with it special meaning for the more discerning reader. It can easily be missed. However every segment of this chapter is fleshed out with increased intrigue in the 20 chapters which follow. Cumulous clouds were advancing toward the Maginot Line as our jet engines announced their approach to Charles de Gaulle Airport. Out of curiosity, I squinted northeast toward those extensive fortifications as we made another swing over Paris. Somewhere out there was a barn where my father had been concealed when that Line proved ineffectual to Hitler’s invasion. Somewhere out there my dad was returned to the war against the Nazis during the liberation of France. His name was Louis, and after that war he wanted no more of the horrors he had survived in Europe. He ended up raising a family in the United States, land of liberty as he loved to call it, never imagining that his son would one day return here to escape persecution in America. That may seem implausible to you, but it was occurring on this very flight. I’ll explain as we go along. For now, it’s the paradox of my bizarre journey through a lucrative court system, a conscientious stand against my profession and an evil which has lurked there for too long. As I peered out the fuselage, thoughts of my predicament overshadowed the grandeur of the city below. Still incomprehensible was my pending status as a fugitive from justice, or more precisely a victim of injustice, a whistleblower not unlike Edward Snowden or Julian Assange. The main difference is that I hadn’t even been accused of any crime. I was no threat to national security. As insane as that paradox in the clouds, my only crime was that I wanted to spend more time with my precious daughters during a divorce case. While committing that crime, I was forced to expose the real ones in a government industry that was extinguishing parenthood as we know it. The shocking events you will now read about comprise the retributions which followed. This was a continuing ordeal after ten years. Its perpetrators figured that no human could sustain such abuse for so long. Who would believe it anyway? Like Nazis in the day, they labeled me, seized my children, ruined my livelihood, and subjected me to a form of house arrest. Ultimately I would succumb to a stroke, breakdown or untimely death. I would simply vanish along with my judicial whistleblowing. Judicial waterboarding is the way I put it before the Supreme Court. My dad endured five years in a Nazi camp after drinking urine from the floor. I’m not Jewish as that might suggest, but between his stories and genetics passed down, he no doubt influenced my own ability to survive. There were gang fights and race riots during my boyhood, high school football when corporal punishment was standard procedure, legal hazing in my college fraternity, law school in greater Chicago, a death defying event on a mountain and the 2016 elections. Alas, this would be a walk in the park, or so I thought. Instead, with all the trappings of a Dixie lynching, it became anything but a routine divorce, beginning innocently enough in a city called Utica, New York. In my worst nightmares, I never imagined fleeing oppression in my homeland, seeking protection at the United Nations, on the lam in Lake Placid, addressing national media at a murder scene in South Carolina, sheltered on an island in the Pacific Ocean and now here. I was not on some honeymoon. I had already done that in Paris and could never have planned for this. If only I could’ve avoided it altogether. But a prominent black minister in Manhattan declared this to be my destiny. So here I am, whatever he meant, and it did turn up shocking proof of judicial corruption that would make John Grisham cringe. If there was a destiny, it was shared by every mom and dad descended from the beginning of humanity itself. For all the injury I sustained, this could have been the ride of a lifetime. But I had stirred a hornets’ nest, and in no small way, exposing the raw underbelly of a child control syndicate, a judicial forum where countless parents were summoned to resolve sensitive family matters only to be treated like common criminals. It took my case to our highest court where I filed for disqualification of Justice Ruth Bader Ginsburg due to her politicking from chambers. An accomplished civil rights lawyer, I was naturally drawn to challenge the heartless seizure of children in our third branch of government. That’s the true definition of divorce court. Family court was its evil child where the real carnage occurred. After a two year separation without incident, everything was promising for my daughters. That’s when an invasion was launched by judges and lawyers anxious to conquer my world in a parenting environment they did not belong. A Supreme Court justice had this to say about America’s family courts: “Under our Constitution, the condition of being a boy does not justify a kangaroo court.”  But that was 1967. 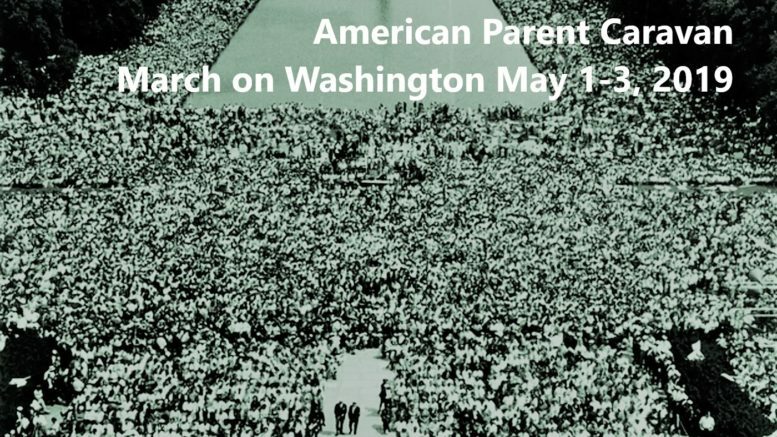 An erosion of parental authority since then has changed his pronouncement to the condition of being a father or career mom which does not justify the stigmatizing classification of “non-custodial parent.” We are now a society living under the yoke of an increasingly fascist system of child control. Proof of this remains viciously censored or masked by highly convincing propaganda. The state dictates to the parents that it is acting at all times in “the best interests of the child,” an utterly preposterous, if not fraudulent claim, before it bankrupts them in a protracted custody or support battle. It creates and then fuels an incendiary contest over one’s offspring only to reap huge profits from the crimes, domestic violence or emotional trauma which predictably results. Victims who oppose this centralized power face the prospect of losing their children, their careers or imprisonment without due process or jury rights, all of it orchestrated under “the law.” It was the common denominator of so many parental advocates I came across during my reform efforts across the country. Victims could not fathom what was truly happening to them while being subjected to investigations and examinations for every indiscretion or human error. This easily abused “best interests of the child” standard remains the weapon to achieve all sorts of unconscionable outcomes. Our children are effectively controlling their parents now under this system, an inverted order of childrearing as I described it in my reports. Moms and dads under constant threat of losing “custody” are spoiling these children while surrendering their natural authority to parenting figures more focused on self-service than genuine parent-child relations. The state must declare the child to be the most precious treasure of the people. As long as the government is perceived as working for the benefit of children, the people will happily endure almost any curtailment of liberty and almost any deprivation. Adolph Hitler, Mein Kampf, Publ. Houghton Miflin, 1943, pg. 403. This Court has abandoned the use of the word ‘visitation’ in its Orders, using the phrase ‘parenting time’ instead. If the word ‘custody’ did not so permeate our statutes and was not so ingrained into our psyches, that word would be the next to go… This misplaced focus draws parents into contention and conflict, drawing the worst from them at a time when their children need their parents’ best. Duggan evaded the core problem in his decision, that elephant in the courtroom known as “profit motive.” Still he was precipitously close to triggering vital reforms. It was no surprise then that his decision was quickly reversed on appeal, and despite similar condemnations in a 2006 judicial report,  the inflammatory depictions of mom and dad have survived. In my own reports, I urged that such terms were more appropriate for prisons and funerals, not parent-child relationships. Our federal government remains a major cause. A bevy of bureaucrats has become the super-parent of American society through coercive funding laws. Enamored with wars declared on every kind of issue to incite tax hikes, they have managed to convert sensitive family disputes into rewarding public battlegrounds bleeding with militaristic decorum. These courts are now overflowing, judges so overwhelmed they delegate their entrusted duties to outsiders who complicate ready solutions. My credible reform message threatened this gold mine. It was one that might take flight with social and secondary media. Hence it had to be eradicated from its inception. Suddenly I was a one man fighting machine according to a talk show host in Florida. I had silent supporters, parents and concerned citizens who could navigate beyond the propaganda of a self-regulating court system. But they were intimidated, and this was also a prophesy of sorts which made me more of a nemesis. During my reform crusade, I explained how power brokers were laying a foundation for the New World Order through this custody institution. Orchestrated court conflict was being exploited to show parental incompetence and the justification for an eventual state take-over of childrearing. It was following the lead of compulsory education and how that became institutionalized. Along the way, collateral damage to our economy was immeasurable through declines in worker productivity. They say the pen is mightier than the sword, but here the power brokers possessed both. My message was not extreme as my persecutors would claim. It was backed by true experts unaffected by the bottom line, billable hours or fictional justice. However, it was also a blow to the egos of lawyers who just didn’t get it, infected by a delusional belief that they were protecting children while profiting handsomely from our misfortunes. And that meant I had to be crushed like a bug. Their agenda began with the usual spineless deflection from duty when a serious wrong is brought before our courts, one which threatens big money interests. Divorce lawyers, child attorneys, diverse psychologists, case evaluators and forensic experts were only some of the beneficiaries I extolled as court predators. They were exacerbating an epidemic for profit, one that was triggering suicides, serious health issues and human rights violations. It was the Goliath I was out to slay. Unrealistic perhaps, but there were weapons in my arsenal. I had an unblemished professional record, won substantial recoveries, defeated high profile law firms to invalidate a billion dollar casino compact,  set free speech precedent as a city corporation counsel, New York Times sent reporters to cover my campaign for Congress, and Morley Safer traveled to my law office for an interview featured on 60 Minutes. How could they discredit all that and more? Well they did. Still, someone had to make this stand for the sake of our children and future generations, or at least go down for something more than personal gain. It is also said that a hearse comes with no trailer hitch. You can’t take your belongings to an afterlife. In this cause, I had found my life’s purpose, a way of helping people long after my time on this earth was over. Everything in my being had finally come together. Every child in every location was now my moral client. Unfortunately, Goliath was a trillion dollar industry, and what few protesters I could find appeared traumatized by it. My own ordeal was triggered by a judge who refused to hear my arguments against the antiquated entitlements of Title IV-D of the Social Security Act. In lay terms, this was the Child Support Standards Act which required the naming of a “custodial parent” for state courts to receive federal funds. It also incited highly profitable custody wars. I was shocked by the number of lawyers who had little or no idea how this law operated to fill their bank accounts. More disturbing, I could easily track the severe harm it inflicted upon everyday society, a veritable Titanic yet to collide with destiny and over-occupied by families originating from all parts of the world. They included stowaways from our schools, homes and workplaces routinely hauled into family courts as needless witnesses to the carnage. Couldn’t these people see the pollution billowing out of those judicial smokestacks? With so much focus on global warming, homeland security and industrial flight, how could they glide so casually over an “inconvenient truth” at the root of so many other societal problems? With more than 300,000 lawyers in New York and California alone, this pollution was growing by the day. These elusive predators made their living selling conflict in a childrearing niche foreign to their trade. Crucial reform was therefore long overdue, but my divorce judge was nearing retirement. Hence, it was no surprise that he was mired in the stereotypes of a distant past, when moms stayed home and dads worked to support children. He would shoe horn me into the degrading “non-custodial” category and presume that anything else I did was irresponsible. That’s before he was replaced by thirty-five trial level jurists by the time I wrote this book, unprecedented in judicial history. Due to my exposure of court corruption, a systemic prejudice had arisen, requiring a venue change. When that was denied, it left me no choice but to move for disqualification of each newly assigned judge. I also urged that fathers remained victims to this last bastion of institutional discrimination due to the lucrative nature of the custody mandate. Shared parenting was a preferred model but this judge was not about to risk his reputation to do the right thing. Instead he punted, referring me to the legislature for reform. Hence, you might say this entire ordeal was court ordered. That I should single-handedly seek a judicial remedy in a legislative assembly was like directing a mechanic to repair a car in a bakery. Any lobbying effort would require my exercise of free speech against my profession. Before a lawmaker could sponsor a bill to change a custody statute, his constituency would need to be convinced the old law was flawed. When I aspired to do exactly that, it was the judiciary which opened fire on my free speech in the forums where constitutional rights were supposed to receive their greatest protection. My plain exposure of the flaws was so offensive that a family judge threatened to have me removed not only from “his” court room, but the public courthouse altogether. When that failed to intimidate me, he issued a gag order which was removed after I challenged it in New York Supreme Court. New York was widely known to have the most dysfunctional legislature in America. Reputable studies declared it, record late budgets proved it, and even legislators sought re-election on that theme, condemning one ethics commission after another for their impotence. I testified before the Moreland Commission on Public Corruption seeking to dissolve the “window dressing” Commission on Judicial Conduct. Instead it was the Corruption Commission that was shut down. You’d get no argument from me that the New York State Senate and Assembly were in dire need of ethics reform. Yet if the citizens of our state ever got around to demanding those changes, it would behoove the people to pay special attention to the behavior of prosecutors and judges who cared more about making a splash in the media than they did about justice. Well this book is about justice and that “special attention” from our citizenry, a collection of shocking stories which reduced a prominent lawyer and model parent into a bankrupt fugitive. It explains why Joe suffered as he did in court after remaining oblivious to all those citizens who complained before the very commissions he helped create. It details the potential consequences for those who truly care about abused children and seriously act to reform our courts. It is also a story of love and devotion. You can send a man across the world and he’ll sacrifice his life in the war on terrorism, you can cultivate domestic violence through draconian laws and he’ll risk himself again in the name of public safety, you can even resurrect debtor prisons for child support and he’ll do his time under protest, but never come between a daddy and his little girls. Even when they’re ninety years of age, he’s busy constructing mansions for them in heaven. In re Gault, 387 US 1 at pg. 28. Webster v Ryan, 729 NYS2d 315 (Albany Fam. Ct. 2001) at Fn. 1. 2006 New York Matrimonial Commission Report to the Chief Justice (the “Miller Report”). It’s been over two months since my last posting on April 6, 2017. I have been focused on completing my first non-fiction book on the subject of corruption in America’s divorce industry. It is an alarming documentary which I hope will elicit nothing less than a parenting revolution for the sake of justice, overdue reforms and our children. It is a truly profound literary work based on ten years in the reform movement and more than thirty years in the courts as a trial attorney, civil rights advocate and aggrieved parent. For those of you familiar with my ordeal, this is a must-read with immense educational value. It was a project started in November, 2014 shortly after the Family Law Reform Conference sponsored by Dr. Joseph Sorge and Divorce Corp. in Washington D.C. It was during a flight to Paris where I was seeking to get international human rights agencies involved. In fact, Joe and I talked on the phone while in different parts of Europe engaged in the same mission of reform. Some excerpts were published on this site in the spring of 2015 but they do not begin to reflect the caliber or quality of the finished product. Its completion was motivated by former New York Senate Leader Joseph Bruno. In his book released this past November entitled, Keep Swinging, Joe chronicled thirty years of corruption, but he blamed the criminal prosecution against him, in part, on apathy of the people to seek reform and justice. Joe Bruno is quoted in my first chapter, one that I intend to reprint on this site on Fathers’ Day to give you a preview of the truly remarkable content which follows, 100,000 words altogether. At present, I have two publishers under consideration as I await a hopeful offer from a world class company. This was a phenomenally complex project. Due to its compelling nature, there are footnotes and references throughout to back up my case for a federal investigation into Title IV-D funding and the corruption it has brought to our court systems and families. This is without question the most suppressed and censored epidemic of our day. My literary release aims to expose it so that serious protests will begin across the country. When a model parent and judicial whistleblower is prevented from seeing his daughters on Fathers’ Day without any report of unfit behavior, not even an accusation of any criminal wrongdoing, while heroin addicts are being reunited for Mothers’ Day, it’s time to take serious action to a level never seen before. With the completion of my twenty chapter manuscript, I will be making uncensored (raw) versions available on this site at a reduced cost of $20. Actually, the raw version is more valuable than the later published version which will be edited to exclude some material which could save litigants thousands of dollars in fees and court costs. The book is bifurcated into two parts. The first (macro) part is largely a collection of stories from across the country obtained over the past ten years. Some are familiar, others are astounding, many are anonymous to protect the victims, but all of them make this a rapid-fire, page-turner. You or someone you know may even be in it. These stories are conveyed not with depressing regurgitation but flavored by romance, humor, education and situations familiar to any parent in these courts. They come from both dad and mom perspectives with the latter derived from one I met in Paris. Hence it has international appeal even beyond English-speaking countries while touching upon most divorce and family court subjects, from custody and support to domestic violence and judicial misconduct. The second (micro) half is a chronology of my personal ordeal. No one truly knows the full scope of persecution I endured for taking a conscientious stand against my profession. It’s the price I paid to make family courts more child-friendly and less lawyer-rewarding. This half is likely to attract lawyers, judges and politicians most because it contains renditions of high profile litigation contrasted by sweet stories about children which are sure to capture the heart. There has never been a publication like this. If successful, it is my intent to start a new book about a victimized father in New York City and finish one about a mom in Montgomery County, Pennsylvania. These are highly challenging assignments because no one wants to read about a he-said, she-said harangue in an isolated family case. Even Alec Baldwin was a failure in his book, A Promise to Ourselves, eight years ago. Media reports focused on his suicide attempts. There were too many years of censorship by the Third Department (licensing and appeals court) which I compared to the Third Reich in my filings. True story. No mention was made of any of this in its reinstatement decision. I was simply responding with the same, if not greater level of boldness to government abuse, hence yielding a clear explanation behind the retaliation which was so severe and unjust. So if you’re still here reading this, you’re in good company. My work has been monitored by judges, politicians, investigators, doctors, lawyers, maybe even an Indian chief. I got the interest of Donald Trump’s chief counsel in 2016. As stated, a family court gag order on my website was removed after I challenged it in New York Supreme Court. Seven website postings were attached in their entirety to a confidential ethics report. Never once was I charged or sued regarding them.